Home Streams AcuteJungle66’s The Turing Test Giveaway Stream! AcuteJungle66’s The Turing Test Giveaway Stream! 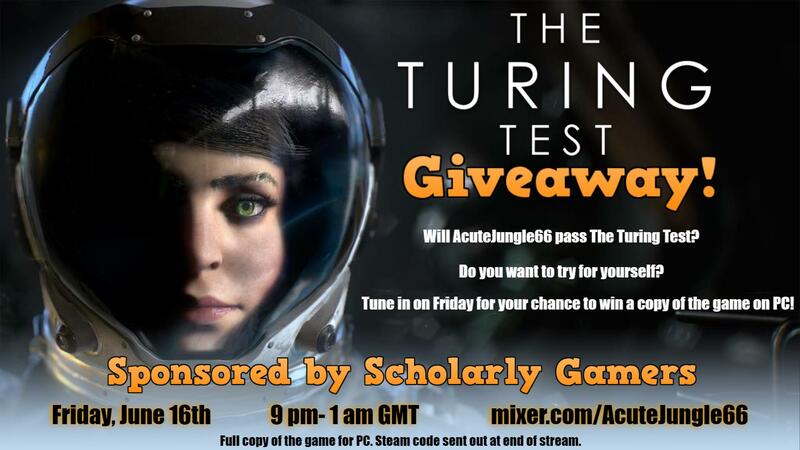 Scholarly Gamers stream team member AcuteJungle66 is giving away a PC copy of The Turing Test, developed by Bulkhead Interactive and published by Square Enix! Be active (and courteous) in chat before the giveaway starts. In an evolving story based on mankind’s instinctual need to explore, protect and survive, you’ll delve deeper into Europa’s ice crusted-core and discover that the lines between man and machine begin to blur. Armed with the Energy Manipulation Turn (EMT), solve puzzles to open the way forward as you learn the true cost of human morality.